Welcome to Lake Affect Cottage and Side Affect Guest house, formerly a diamond in the rough and now turned into a polished gem! You'll immediately see how the right home can "affect" the quality of your vacation. This brand new lake home is just waiting for you, your family, and your friends to make lasting memories. The home, situated on a wooded corner lot, is conveniently located between two beach access points, each just 1.5 blocks away. Lake Affect is also close to restaurants, shopping, kayaking, farmers markets, wineries and breweries, golfing and all that Harbor Country has to offer! The open living space with vaulted ceilings has a fully equipped kitchen with quartz countertops, an under cabinet beverage refrigerator, and seating for 6. The generous dining room can seat up to 10 for family dinners and game night gathering while the sun-filled great room has large gas fireplace, flat screen TV, ceiling fans, and two comfy couches for movie watching or afternoon naps. Sliding doors open up onto a welcoming mahogany deck for outdoor dining and entertaining and also includes a Weber gas grill. 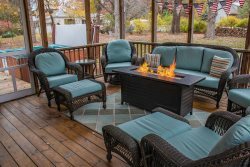 A fire pit in the yard turns chilly nights cozy and is perfect for roasting marshmallows. A large circular driveway provides plenty of parking for you and your guests. The master bedroom has a king bed with direct access to a large bathroom with a walk in shower and double sink. The 2nd bedroom has a queen bed and the 3rd bedroom has a twin over full bunk bed with television. Each bedroom provides beach towels and terry bathrobes in the closet for your use. These bedrooms share a hall bathroom with tub and shower. Mudroom access with laundry room has plenty of hooks for wet bathing suits and towels or snow boots in the winter. Spend a few days or a few weeks at Lake Affect and go home feeling totally refreshed! SIDE AFFECT - Guest House Details - Closed for the cold weather months. The renovations continue with the totally overhauled, one bedroom guest house. Complete with a full kitchen, dining, living area, and full bathroom, this add-on is perfect for additional guests who would like the privacy of their own space with all the functionality. Guest is welcome to use any beach items in the shed.